The earth is a very crowded place. Maybe not for many animal and plant species that have been battered by overfishing, hunting or harvesting, but for we humans and the many ecological systems we impact, we're rubbing shoulders in a very big way. Just ask Struan Stevenson, Member of the European Parliament and president of the European Parliament's climate change, biodiversity, and sustainable development group. Stevenson's concern is that in our attempts to address some of our energy needs and reduce our output of carbon into the atmosphere - in particular, the development of wind farms - we are damaging other natural systems that can also contribute to reducing or storing some of the 2.2 million tons of carbon being expelled into the air daily. In Europe, wind farms are being constructed along shallow shorelines in places like Scotland to help reduce some of the continent's dependence on fossil fuels. Sounds good at first blush, but wind farms won't completely solve the carbon issue. In these cold northern waters, nature itself can lend a hand in the form of carbon sinks or carbon sequestering in sea grasses and salt marshes. Ocean acidification - the raising of the ocean's pH or acidic level through the dissolving of excess CO2 emissions into the ocean - is being accelerated by increases in ocean water temperatures, but in the North Atlantic, shallow aquatic flora can help to slow down the process. That is, unless these vital marine ecosystems are being destroyed by well-intentioned builders of wind farms. "Recent research has indicated that a tiny part of the marine environment – the mangrove swamps, salt marshes and seagrasses that cover just 0.5 per cent of the seabed – account for the capture of at least half, and maybe three-quarters, of this blue carbon [carbon stored in ocean environments]. They are our blue carbon sinks and keeping them in good shape could be one of our most important undertakings to control climate change. While most mangrove swamps are in the tropics and subtropics, the United Kingdom possesses large areas of the other blue carbon stores with its seagrass meadows and salt marshes. Government agency Scottish National Heritage has noted that the vast majority of the UK's seagrass meadows are located in Scottish waters, accounting for some 20 per cent of Europe's total," said Stevenson in Public Service Europe. Due to the northern water's overall reduced visibility, salt marshes and sea grasses tend to grow in fairly shallow waters, less than 16 feet in depth. So, it would seem reasonable that offshore wind farms should be constructed and placed in deeper water. Apparently though, in a rush to establish wind energy technology as a viable alternative, the farms are being located in shallow areas and destroying a vital source of natural carbon storage. 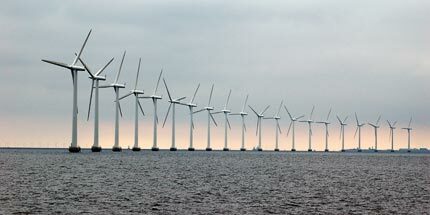 Stevenson says nearly 200 turbines have already been built in shallow waters in the North Sea. "At present, a number of developers are preparing applications to site huge wind farms in the Moray Firth development area as the Scottish Government has noted that the region 'has favourable conditions and significant potential for the development of offshore wind both within Scottish territorial waters and beyond into Scottish offshore waters'. The government does not mention either saltmarshes or seagrasses in its 'sectoral marine plan for offshore wind energy in Scottish territorial waters', though they do note that there are potential adverse effects on bottlenose dolphins," Stevenson said. Of course, the development off alternative energy sources like wind and solar needs to be maximized to help reduce the level of CO2 emissions. But it can't be at the expense of the planet's natural carbon sinks that help to sequester excess carbon. We wouldn't level a forest to build a solar energy farm, and so it is the same for offshore alternative energy and the ocean's natural devourers and holders of carbon. Mankind has assaulted nature with this problem of its own invention and now, as we struggle to come up with solutions, we must ensure that we give nature enough room to do its thing and be part of the solution, too. "The message to policy-makers is clear - we cannot afford to sanction the continued destruction of our remaining blue carbon habitats merely to fast-track wind farm development. Blue carbon sinks are far more effective in the battle against climate change than turbines can ever be and it is time they received full protection." Wait a minute here. Are there EIS on the farms? Is there any evidence of destruction of seagrass beds? Having plenty of experience with such things, I questions the underlying assumption that there is dammage of any note. The mention of mangroves would seem to be specious. Nobody would site wind in mangroves, way to difficult and expensive. If there is damage, it is not that hard to mitigate. The FKNMS regularly replants seagrass damaged by boats. Contrary to Stevenson's claims, a farm would tend to protect seagrass beds by causing large vessels to take an easier route. Zostera marina (the type of seagrass most prevalent in Scotland) grows in sheltered bays and lagoons from the lower shore to about 5 depth, occasionally down to 10m, so I doubt if most offshore turbines will disturb a single stalk. Thank you for sharing this detailed summary.